We are buying Brick City, and we will expand the Jordan Valley Innovation Center to stimulate cutting-edge research in Springfield. 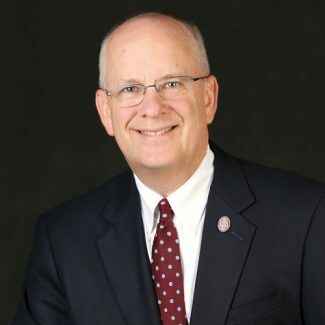 In the 2000s, Missouri State University leaders had a vision. We wanted to redevelop a portion of Springfield’s center city. With the help of the city and local government, we would create an urban innovation park. It would blend university programs with residential, retail, commercial and entertainment facilities. The park would celebrate and encourage Innovation, Design, Entrepreneurship and Art — and so the IDEA Commons concept was officially named in 2007. Now, more than 10 years later, IDEA Commons is part of the fabric of Springfield. Keep innovative people in our community and attract young, creative talent. Continue the revitalization of downtown. Expand opportunities for research and development. Develop partnerships between the university and entrepreneurs. Promote economic development through new job opportunities. IDEA Commons continues to adapt. In 2008, Brick City — a group of historic downtown buildings with brick exteriors — was renovated. Missouri State’s art and design department moved into many of the spaces. Private businesses and other academic programs moved into others. This rehabilitation was made possible through a public-private partnership involving Missouri State, the city of Springfield and several businesses. This renovation was originally done with developer Miller Commerce, which accessed historic tax credits to make the project feasible. MSU leased the buildings each year. We anticipated that we would eventually purchase them. In fall 2018, we finalized an agreement to buy buildings 1, 3, 4 and 5, and the adjacent parking lots. We will sell bonds to finance the purchase. Now that we are buying at about the same rate we were leasing, there will be no additional cost to the university. This is one example of an IDEA Commons project that benefited private business, the city and the university. We hope there are many more to come. One project on the horizon: Growing the Jordan Valley Innovation Center. We plan to expand the space owned by MSU. A commercial office building, to be owned by a private company, will also be constructed. The area will include landscaping and parking. Eventually, we hope this will lead to exciting amenities for those who live and work here. We have had a lot of partners in this vision. Missouri Sen. Jay Wasson led the legislative changes needed to get this expansion named as a tax-increment-financing project in the state budget. The city of Springfield approved its commitment to the project, including tax incentives and financing for stormwater and streetscape improvements. 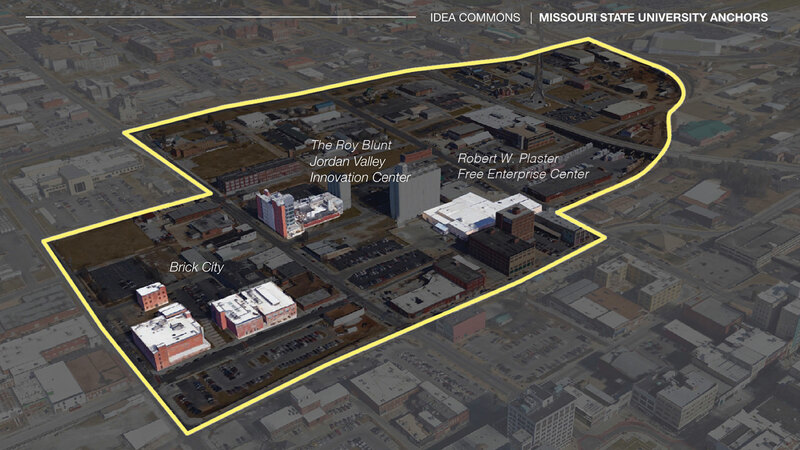 IDEA Commons brings together corporations, the university, lofts, nonprofits and retail space. It’s a downtown community where people can live, shop, learn, create and work. This facility, known as JVIC, is a former feed mill. It is now a seven-story state-of-the-art research facility. Here, students can gain hands-on experience and corporate partners can develop innovative products. The focus at JVIC is environmentally friendly projects, with an applied research emphasis on biomaterials, nanotechnology, carbon-based electronics, biomedical instrument development and energy. Brick City: Brick City consists of several buildings. It’s a creative hub with many art programs and galleries. Building 1: This four-story building was built in 1927. It was once owned by the Springfield Ice and Refrigerator Company. The art and design department moved into the first three floors in July 2013. It has space for administrative offices, art history, ceramics, digital arts, graphic design, metals and jewelry, and photography and printmaking. A portion of this building is the Springfield campus of the University of Missouri-Kansas City’s School of Pharmacy. Former building 2: This building was demolished, leaving vacant space between buildings 1 and 3. Building 3: This three-story building was built in 1914. It started as a cold-storage building. MSU moved into the space in July 2011 and occupies the first two floors for art and gallery space. The third floor is leased to Marlin, a full-service advertising agency with a national reach. Building 4: This two-story building was built in 1915. It was a processing and storage facility for cheese. MSU moved into the space in 2009. It houses sculpture, drawing and painting programs, and the Brick City Gallery. Building 5: This former boiler house was built in 1900. MSU moved into the space in July 2013. It is used as lighting studios for photography. This center, a former turkey-processing plant, is a one-stop shop for new small businesses. It includes the efactory, a business incubator that provides resources, gives guidance and assists with start-up activities. These are suites used both for residential lofts and private retail. Types of businesses here include medical equipment development, interior design and more. This federally qualified health center serves the uninsured and underinsured of southwest Missouri. Here, officers support investigations from around the state. IDEA Commons is on about 88 acres in Springfield’s center city. It is bounded by east Chestnut Expressway to the north, Water Street to the south, north Campbell Avenue to the west and Jordan Creek to the east. The Missouri Development Finance Board has awarded us tax credits and a loan to support the project. The JVIC expansion will be owned by the Vecino Group for the first seven years, and we will lease it. MSU has the option to purchase after seven years. Because of this structure, and the level of city and state support, we expect to eventually recoup our investment on this project. However, we will need your support as we move forward. 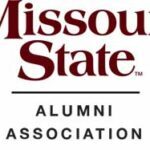 The Missouri State University Foundation will likely seek private gifts, and there will be some opportunities for namings as we expand IDEA Commons. We could potentially break ground this fall, so expect to hear much more about this project. 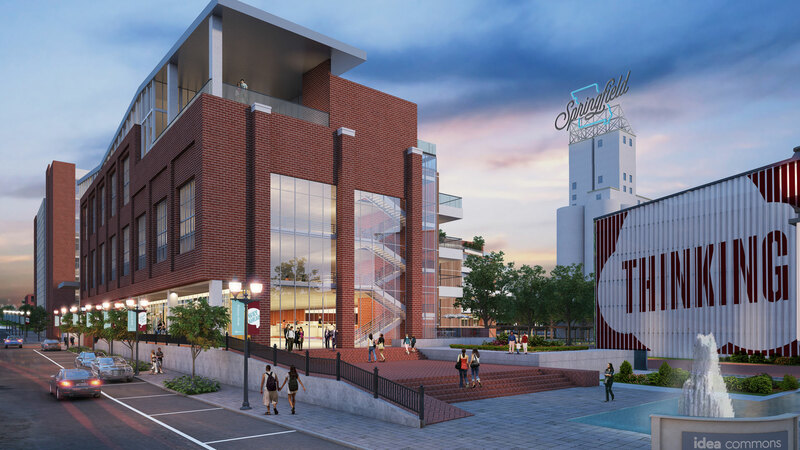 We’re so excited about the role this expansion may play in encouraging cutting-edge technology, high-paying jobs and expressive creativity in this region. I encourage you to follow along, and add your own support, as the ideas keep coming. Cannot agree more that our downtown needs more attention and renovation! So excited and looking forward to a modern look SGF downtown! For me, I think this idea is fantastic and achievable! The only thing I may mention is that if our school want to expand brick city, then not only the outside view, also the inside facilities of brick city like every studio. In addition, we can have a wall like the wall opposite to brick city building 3&4, which can let young talent to distribute their innovation and talent in art.